Discussion in 'Pens, Pencils, Notebooks, and Notebook Covers' started by Dave Johnson, Mar 16, 2014. Has anyone out there tried the new journals by Shinola (made in the US, available in soft and hardcover in 3.75"x5.5", 5.25"x8.25" and 7"x9" format) and Baron Fig (hardcover, 5.4"x7.7")? Their prices seem reasonable. The Baron Fig notebooks are supposed to be fountain pen-friendly, but I haven't verified this myself. I'm just curious to know what they are like. 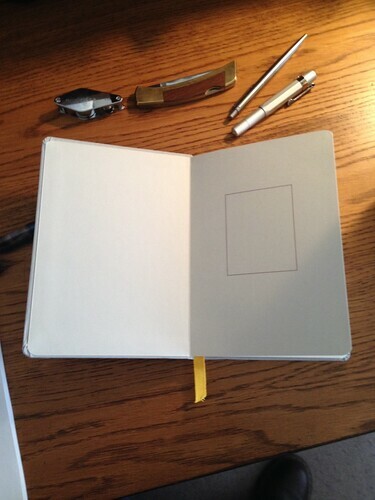 Any alternatives to the ubiquitous Moleskine are interesting. I ordered one so I could review it. That way I can tell you whether it is or Shinola. scbubba, hunter s gatherer, Dave Johnson and 1 other person like this. OK, John. Since you've been good enough to take the initiative, I'll order the Baron Fig notebook and give it a test-drive. I'll post what I discover here. At this minute, I'm using an ecosystem notebook with a fountain pen and not loving it. Works OK with a dry pen like my Lamy Safari ex-fine, but not with a more 'normal' pen. Moleskine is marginally better. Leuchtturm is the best I've tried so far with fountain pens. Rhodia is supposed to be the best, but it's expensive. Hoping the Baron Fig or Shinola is at least as good as the Leuchtturm. Subscribed. Looking forward to reading the reviews and seeing the pics! SAKplumber, atilano and AK Adventurer like this. 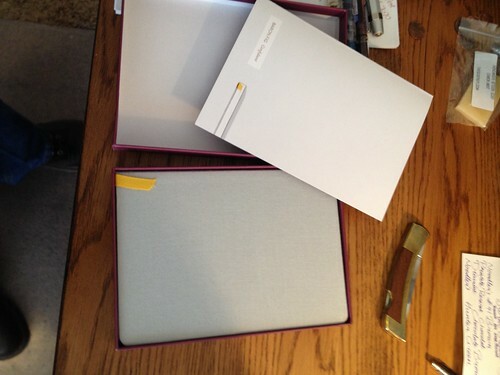 The Baron Fig notebook is on its way to me. Bought one with blank pages. If anyone else is thinking of getting one and is undecided about blank, dot grid or lined, perhaps get the lined or dot grid and let us know what you think. If I like the blank one, I'll go ahead and order the others eventually. I'm being forced to switch inks for use on the ecosystem notebook. Apart from the bleed-through and feathering with my current fountain pen ink (Private Reserve Tanzanite Fast Dry in a Platinum Preppy with medium nib), I think that these are decent notebooks and would work fine for anyone using a ballpoint (gel pens probably not so much). Haven't had any problems so far with the perforated pages coming out, and overall the notebook is well put together. I'll probably switch to one of the Noodler's inks and see how I fare. 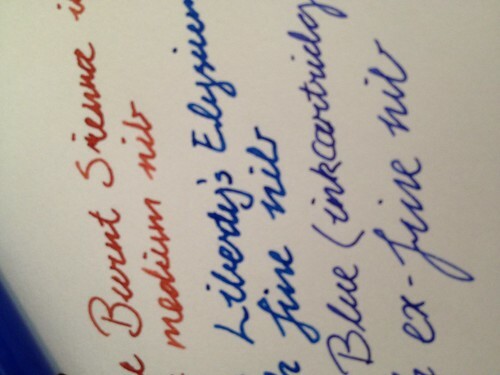 Otherwise, it's back to my ex-fine Lamy Safari, which has a Lamy cartridge (pretty 'dry' ink). The Shinola arrived today. Apparently I can't tell the difference between the small and large because I ordered the small. It's very well presented. Nice thick packaging. Book wrapped in tissue with a black ribbon and a Shinola sticker holding the paper together. Inside the paper was the book encased in plastic and a thick 110lb-ish stock cover. 192 60lb pages. Initial writing test was with Mont Blanc 149 loaded with Diamine Ultra Green. It's the wettest pen in my collection. Smooth paper, no bleed through. Next test was with a Jinhao Dragon's Offspring loaded with Noodler's Lexington Gray. Again, no bleed through. Much nicer paper than the Moleskine I use daily at work. It is thicker than the Moleskine which makes sense with heavier paper. The only negative for me is that it only comes in ruled. I'm used to using grid or blank. I'm going to order the large and have Mrs. Pettimore shoot the unwrapping process and update the thread. atilano and AK Adventurer like this. 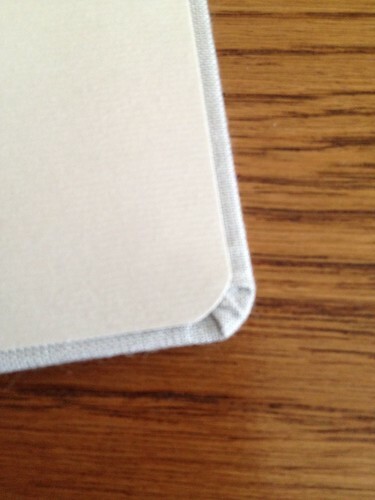 Update: Well, I placed an order for a large journal and a leather zippered pouch. Wouldn't you know that about an hour later I opened the journal and the cover split right in the hinge where the spine hinges with the front cover. Emailed form to Shinola customer service asking for replacement or to cancel my subsequent order. Will advise what I learn. Update: Called Shinola customer support. The representative (Eric) I talked to was very professional and very apologetic. He checked with their journal team to make sure this was an isolated issue (of course it was). Shipping a replacement right away (my order from last night had already shipped). If any issues with either order they'll send a call tag and issue an immediate refund. They exceeded my expectations by doing exactly what I would have done if it had been my business. jdub4key, atilano and AK Adventurer like this. 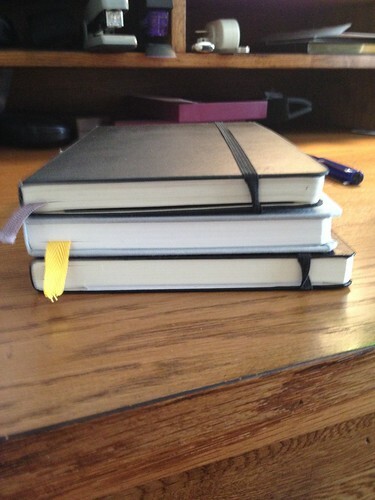 Comparison with Moleskine w/blank pages (on top). 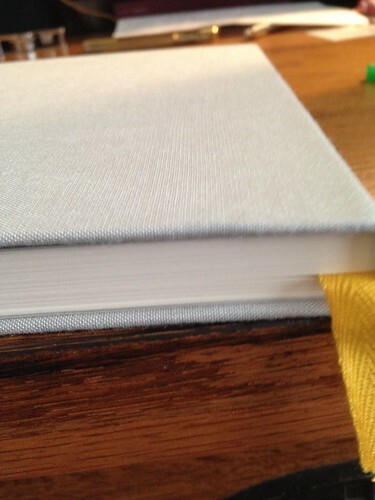 Not as much of a difference in thickness as there was with the small journal. Right in the middle a defect. I was so disappointed. Looks like another conversation with their customer service department is in order. Will update again after that conversation. While they look good, I would be reluctant to purchase from them. I would definitely let Shinola know that you are blogging this and there are several other members following the topic. Good luck. Clearly they have QC issues. Too bad as they look nice. All this fancy wrapping didn't stop the notebook from having a slight dent on the edge of the cover, but it's not enough for someone like me to worry about. The notebook is going to get dented anyway from me carrying it around. The paper is very slightly textured. I expected this to result in feathering with my fountain pens, but it didn't happen. I had to use a loupe to see the very slight feathering. Certainly not enough to worry any reasonable person. The fountain pen-friendliness of this notebook is superior to Moleskine. It is also superior to Leuchtturm, where I got bleed-through when using Noodler's Liberty's Elysium ink in a Platinum Preppy with a medium nib. 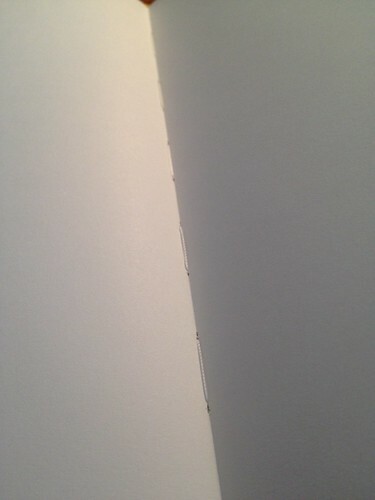 I can't comment on the lined or dot-grid versions of this notebook. I will probably order them at some point in the future and update this thread. 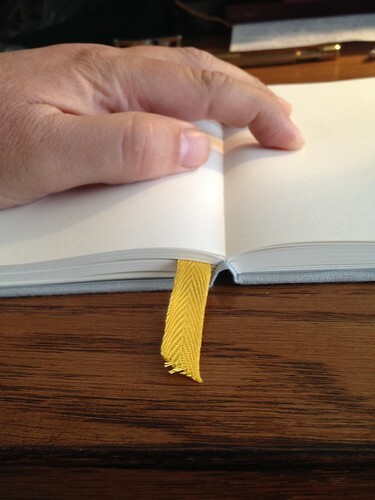 No elastic band to hold it closed, a la Moleskine, Leuchtturm, Piccadilly, ecosystem, etc. Only time will tell how this notebook stands up to daily use and carry. foxmo and AK Adventurer like this. Update: Spoke with Shinola CSR this morning. They apologized again for the issues and assured me they were not normal. 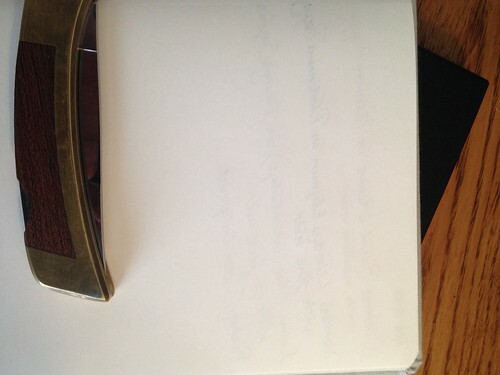 I've sent them copies of the pics as well as a link to this thread and they have committed to replacing both journals. 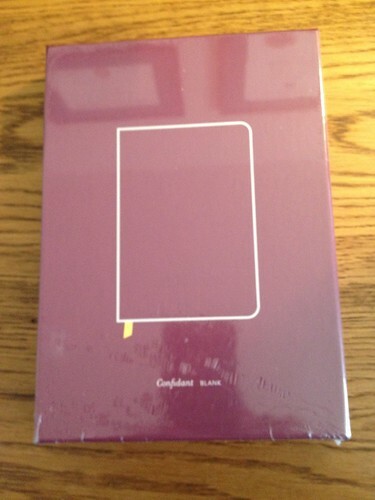 The original replacement for the split cover'd small journal still hasn't arrived. Thanks for keeping us up to date. I won't be ordering anything from these guys until your issues get resolved. I'd like to be able to compare their product to Baron Fig's, but I'm not keen to waste my time returning defective merchandise. Yeah, +1! Thanks for the great reviews and info JLP! Very helpful reviews, thanks for sharing the info. Very interested in investigating the qualities and costs of notebooks that would represent a good value in comparison to certain other previously-existing brands that have been steadily increasing their suggested retail pricing in the last few years.